Is your idea of a dream holiday enjoying some quality time in the great outdoors with family and friends? With an Al Fresco Holidays discount code you can enjoy fantastic savings on mobile home holidays in some of Europe's favourite parks. Whether you want a seaside break on the sunny Spanish coast or a getaway in the French countryside, Al Fresco Holidays discount codes will save you money when you book. Al Fresco Holidays was set up in 2004 by a team of experienced European camping professionals. Their vision was to set a new standard in luxury camping accommodation and to establish a consistent guarantee of quality for families wanting to plan a camping adventure in other countries. Today, they benefit from the security of being part of one of Europe's favourite travel groups, and have properties in all of the favourite parks and locations across Europe. An Al Fresco Holiday is designed to offer families luxury outdoor living without spending a fortune. They offer mobile homes of a very high standard in enviable locations throughout France, Spain, Croatia, Italy and Holland, with plenty of essential luxuries such as air conditioning, power showers and modern designer kitchens. A world away from draughty tents and poky hotel rooms, Al Fresco Holidays' mobile homes offer plenty of space for the whole family to relax and unwind. Al Fresco Holidays are only available on the top holiday parks in Europe – parks that have been specially selected for their facilities and offer incredible pools, tasty places to dine out, wonderful customer service and – most importantly – a relaxed and fun holiday atmosphere. Looking for an action-packed break with the family? Many of their resorts are located in the middle of busy towns with all their attractions and facilities, while many boast thrilling water parks on site. Or perhaps you want something a little more rural and slower-paced? Al Fresco Holidays also offer breaks in some stunning countryside locations, with spas for pampering yourself and plenty of space to really get back in touch with nature. Fancy something that little bit special? Why not treat yourself to an Al Fresco Holidays Luxe Package? Featuring a beautiful decked area with shady canopy and high specification barbecue, they're the perfect place to kick back with family and friends at the end of a perfect day. Want to get booking with Al Fresco Holidays? With an Al Fresco Holidays discount code you can enjoy fantastic savings on their wide range of mobile home holidays across Europe. So whether you want a break by the sea or an escape to the country, an Al Fresco Holidays voucher code will help you save the pennies. Choice of locations from bustling seaside resorts to quiet rural escapes. Browse our website until you find the Al Fresco Holidays discount codes that suit you, then navigate to their website to begin searching. Click on a holiday for more information. Enter your Al Fresco Holidays discount code in the box provided and click 'OK'. Want to find out more about Al Fresco Holidays? Why not check out their dedicated YouTube channel here? You'll find lots of exclusive content including video diaries of an Al Fresco Holidays break, resort guides, travel tips and more. You can also use this channel to find out more about saving money with Al Fresco Holidays voucher codes. If you've enjoyed shopping with Al Fresco Holidays, you might also like to check out more great deals on accommodation and travel around the world with stores like Booking.com and lastminute.com. Or, if those aren't right for you, you'll find plenty more deals to browse in our Travel section. Enter your details and click 'Validate'. Enter your payment details and click 'Confirm' to complete your booking. Need to speak to the team at Al Fresco Holidays? Whether you have a question about your booking, want some expert advice on choosing the right resort for your holiday or just want to find out more about how you could make big savings with Al Fresco Holidays voucher codes, you can contact the Customer Services department by accessing the online contact centre here. Want to discover more from Al Fresco Holidays? Why not follow them across your favourite social media networks? You'll enjoy access to lots of interesting content including competitions, special offers, travel advice and much more. You can also use these pages to find out more about saving money with an Al Fresco Holidays voucher code. Don’t forget to check them regularly, as you can never be sure when free Al Fresco Holidays discount codes might be waiting for you! Buy now online at www.alfresco-holidays.com. My husband and I wanted to take the kids abroad for the first time, but didn't fancy a stay in a hotel. Then I discovered an Al Fresco Holidays discount code online. 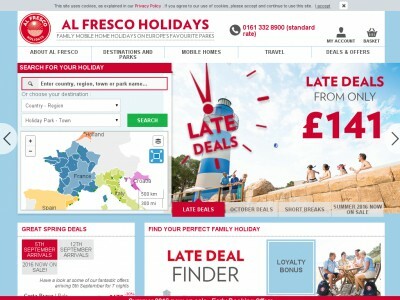 With Al Fresco Holidays discount codes you can get great deals on some fantastic family holidays at mobile homes across Europe at alfresco-holidays.com. I used my Al Fresco Holidays voucher code to get a really cheap rate on a week's self-catering in rural France. Now we can't wait til the holidays! So why not get away from it all with Al Fresco Holidays voucher codes?